At Argyle Feed Store, we take pride in being able to provide North Texas ranchers with all of the ranching supplies and equipment that they need. 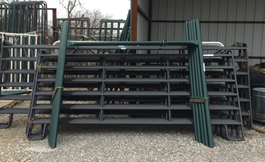 We have a great selection of gates and panels that are perfect for your farm or ranch. We also keep these livestock gates stocked and on hand so you do not have to worry about a long shipping fee or wait time. We carry some of the top brands of livestock gates including Ranger Gates and Hutchison Western livestock equipment. If you would like more information on the farm and ranch equipment that we carry, please click here to view a selection of our products. Here at Argyle Feed Store, we are committed to making sure you find exactly what you are looking for. If you have any questions about these great livestock gates and panels that we offer, then please click here to visit our contact page. We will be more than happy to answer any questions you may have.